Reading Jean Hanff Korelitz’s You Should Have Known was sort of like entering into a brief but doomed relationship. At first, you’re over the moon about your new flame, and the object of your affection can do no wrong. Then, after spending some time together, the cracks start to show. Little things start to annoy you. By the end, you feel cheated and betrayed and just want it to be over, already. Then, after the dust has settled, you look back with some fondness on the whole thing, through a haze of nostalgia, and wonder if you were being too harsh all along. This metaphor, I think, is particularly apt given the plot of Korelitz’s novel, which focuses on a relationship expert whose own relationship, in fact, is not what she believes it to be. In You Should Have Known, we meet Grace Reinhart Sachs, a successful therapist in Manhattan who’s just written what is sure to be a bestselling book, provocatively titled — you guessed it! — You Should Have Known. The premise of Grace’s book is that women facing failed relationships have no one but themselves to blame: they should have seen it coming from the clues their partners were dropping the entire time. This smug premise may rub people the wrong way, Grace knows, but she believes with all of her heart that an ounce of prevention is the key to ensuring happy relationships. In other words, Grace’s message to women can be boiled down thusly: just don’t marry the wrong man, and you’ll be fine. As the book unfolds, we learn, from Grace’s perspective, about her picture-perfect life: she’s married to a successful pediatric oncologist, has a thriving therapy practice, and is mother to a bright twelve year-old boy who attends a prestigious private school, Reardon (the same school that Grace herself attended). Everything’s hunky-dory until a fellow Reardon mother turns up murdered, and Grace’s husband becomes the prime suspect. As Grace revisits her life with her husband, examining what appear to the reader to be fairly giant red flags that she somehow ignored for the past eighteen years of her marriage, she realizes, with dawning horror, that she married a psychopath. Accepting that her husband did in fact do the very bad thing he has been accused of, Grace skips town and takes her son with her, settling in her family’s cottage in Connecticut as she licks her wounds and starts over. Unfortunately, as Grace flees Manhattan, the book loses its way. I was so excited about You Should Have Known when I started reading it because it had such great promise. The idea of a relationship expert who finds herself hoisted by her own petard when she realizes that she failed to take her own advice with spectacularly awful results (she married a murderer, whoops!) is delicious, and the suspenseful chapters in which Grace figures this out are wonderful. I loved Grace’s dawning horror as she realizes that everything she believed about her relationship was a lie. But the suspense that Korelitz builds is frittered away when Grace packs up her kid and drives to Connecticut, where she starts an idyllic new beginning in her family’s rustic lake-house and begins to fall in love with the handsome neighbor. Bluh. All of the potential for drama and suspense escapes out of the plot like air out of a balloon as Korelitz subjects the reader to Grace’s reawakening at the lake-house. As a reader of a psychological thriller, I’m far more interested in the direct aftermath of the main character’s marriage with her husband, the dangerous sociopath, and a confrontation with said husband than I am in seeing the main character reconnect with old friends, develop a crush on the guy who lives in the next lake-house, and enroll her son in a good public school in Connecticut. It begs the question: as an author, why create a dangerous, sociopathic husband if he’s not also going to stir up a little trouble for his family? As murderous sociopaths go, Jonathan’s kind of a dud. Sure, he kills the lady in the beginning, but then he makes no attempt to make things difficult for Grace, who’s cooperating with the police, or to reclaim his son, who Grace has removed from the scene with nary a protest from anyone. In fact, Jonathan spends the entire novel off camera, which, in the beginning, helps to build a sense of unease, as if he could spring from behind a corner at any moment, but by the end, feels like a big wasted opportunity. Also, being a writer, I took issue with Korelitz’s overuse of certain words and phrases. I guess I should take this up with her editor, but someone should have intervened after the seventh time she used the word “unlovely” to describe a building. My inner Hemingway was also cringing at all of the adverbs. SO MANY ADVERBS. Her favorite was “not unkindly,” as in, “he said, not unkindly.” Let me tell you: no one was unkind, ever, in this book. Adverb abuse gets my hackles up. And I know that no non-writers care about this, at all, but I am a writer, and I do care, so it affected my enjoyment of the book. So, was this book a waste of time? No! I did enjoy large swaths of it. I loved the descriptions of life within the upper echelons of Manhattan, particularly in the close (and catty) environment of a private school. I thought the character development of Grace was fantastic (and, for what it’s worth, I pictured her as looking like Heather Dubrow from the Real Housewives of Orange County). I even enjoyed reading about Grace’s interactions with her long-lost friend Vita, from whom she had become alienated after her marriage to Psycho McGee (one of those large red flags I referred to above). But these things do not a psychological thriller make. I wish that Korelitz had followed the momentum of the first half of her book to its thrilling conclusion. It would have been a much different book, yes, and, in my view, would have been a better read. 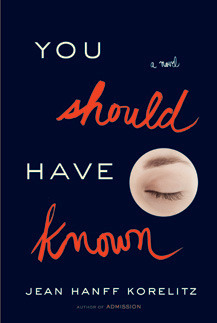 This entry was posted in Books and tagged books, fiction, Jean Hanff Korelitz, thriller, You Should Have Known on April 28, 2014 by Stephanie.